love and suffering of the young. 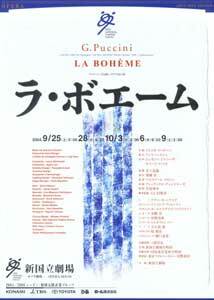 "La Bohème" is a bittersweet love story of aspiring artists who dream of the future. With its succession of beautiful arias, this opera invites tears at the bravery of the ill-fated heroin and is dense with the young Puccini's charisma. Exceptionally romantic songs paint this story of youth: Rodolfo and Mimi meet and are drawn to each other while recounting their life's stories in "Che gelida manina " and "Si, Mi chiamano Mimi, " Mussetta desperately acts coquettishly in "Quando m'en vo" (Musetta's Waltz), and, deciding to part for love's sake, Rodolfo and Mimi join in the poignant but beautiful duet, "Addio, dolce svegliare." The intimacy of the garret where Rodolfo and Mimi meet, Christmas at Cafe Momus where the young sing the praises of love, the snowy scene that cuts through the loving and sorrowful decision - Aguni Jun's delicate directing seems to view Paris from above, deeply moving the viewer with the contrast of youthful dreams and the dispiriting world. We know you will enjoy both the ensemble of highly anticipated young singers that portray the youthful companions, and the New National Theatre, Tokyo debut of the unique conductor, Inoue Michiyoshi. The impoverished poet Rodolfo and the painter Marcello share a garret in 1830s Paris. On Christmas Eve, Rodolfo meets his neighbor Mimi and they quickly fall in love. Meanwhile, Marcello and Musetta are reunited after a chance meeting at a cafe, causing the young companions to sing of the magnificence of love. However, concern over Mimi's illness causes she and Rodolfo to part. Time passes and Musetta brings a dying Mimi to Rodolfo. As he holds her, Mimi silently breathes her last breath, bringing Rodolfo to bitter tears.